This game is a clone Mr. Driller! Miss Driller2 is a clone Mr. Driller. This game is designed for Berry Linux. 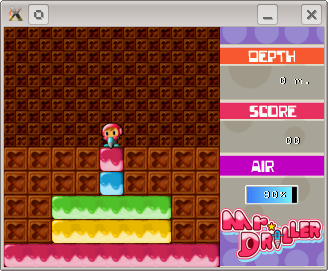 Miss Driller2 puts the player in the role of a driller moving down through screens of blocks, having to keep his air supply from running out while avoiding being squashed by falling blocks. Copyright © 2011-2012 Yuichiro Nakada. All rights reserved.